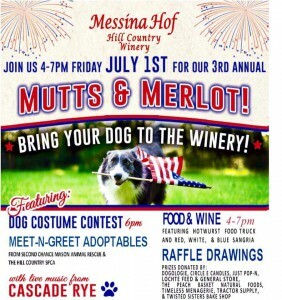 Join us July 1st, from 4-7pm for the 3rd Annual Mutts and Merlot Event at the Messina Hof Hill Country Winery. Bring your dog to the Winery!! Lochte Feed and General Store will have a booth set up giving away FREE dog treats and dog food samples! Don’t miss out on the fun! We want to see you and your pup this Friday at the Messina Hof Winery! This entry was posted on Monday, June 27th, 2016 at 11:26 am	and is filed under Events, News & Updates. You can follow any responses to this entry through the RSS 2.0 feed. Both comments and pings are currently closed.